Beware the sweet tooth! Many of the treats you crave are the very thing that may cause that sweet tooth to be a problem tooth…or worse, one that is beyond repair! Temptations wouldn’t be called temptations if they were easy to avoid! Interestingly enough, many times troublesome treats that can harm your teeth are not so obvious. Following is a list of the top foods that can lead to tooth decay and even tooth loss! Bread, especially refined white bread, quickly breaks down into sugar and easily hides between teeth, leading to cavities. Additionally, acid is released when the naturally occurring bacteria in your mouth feed off these simple sugars. These acids lead to tooth decay because the enamel on your teeth becomes weakened or eroded by the acid. Finally, hard, crunchy toast may be at the top of your favorite food list, but biting into a hard piece of toast can actually break or crack your teeth. If you can’t avoid bread altogether, opt for whole grain breads which are more nutritional. And if you must toast, toast lightly! Alcohol dries out your mouth, leaving you susceptible to gum disease and bacteria growth. Alcohol works against the body’s natural oral health defense – saliva. Saliva helps remove bacteria and plaque, neutralizes acid, and keeps teeth moist. Alcohol dehydrates the body, and the mouth, sabotaging your natural tooth decay defenses. The acid in alcohol can compromise tooth enamel. Teeth exposed to the acid in alcohol are more susceptible to chromogens attaching themselves, resulting in tooth discoloration. Chromogens, or pigment-producing microorganisms, give beverages their color. Generally speaking, the more intense the color, the higher the chromogen content, and the more likely to cause tooth discoloration. Red wine has more chromogens than white wine and contains acids. However, while white wine is lower in chromogens, it is generally more acidic. So both can cause tooth damage. Beer is also acidic and the darker the lager, the more staining potential. Be aware that some mouthwashes contain alcohol which can lead to dry mouth. So even if you don’t partake in a drink, you may experience the ill-effects of dry mouth from the alcohol in your mouthwash! Acids in citrus fruits and citrus drinks wear away at your enamel, weakening your teeth. We generally think of citrus fruits as healthy because they contain Vitamin C, which our bodies need. While this is true, continuous exposure to these acids can erode the enamel on your teeth and lead to tooth decay. Fruit is a better choice than fruit juice because you aren’t as likely to eat three oranges as you are to drink an eight-ounce glass of juice! Better yet, opt for water over citrus juices, or drink water afterwards to rinse the acids away. Sticky or chewy candies not only take time to eat, they attach to teeth and allow sugar to feed bacteria, leading to decay. It should come as no surprise that candy is bad for your teeth. However, chewy candy has become increasingly popular. There are gummy versions of nearly everything you can think of: bears, worms, even vitamins come in a gummy form! The popularity of sour, chewy candies such as Sour Patch Kids has given rise to many popular chewy candies adding a sour variety (think Skittles and Starburst). When you take an already-bad-for-your-teeth sticky candy and add in the sour factor, the acid and sugar can really pack a punch to your teeth. 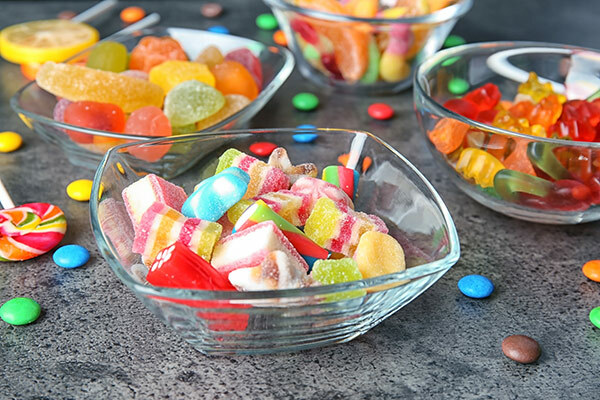 Eliminating or at least limiting candy, especially the chewy, sour variety, will go a long way in preventing cavities. If you do occasionally splurge, be sure to rinse well with water to help remove sticky residue from your teeth. And remember to brush and floss…but wait about 30-60 minutes to give your mouth time to neutralize the acids. Water may be very healthy, and ice itself is not an issue, but chewing ice is like chewing any other hard substance and can lead to chips, cracks, damage to crowns, or broken teeth. There is also the potential to shock a nerve in a tooth which could necessitate a root canal. While broken teeth and root canals may be the extremes in tooth damage possibilities from chewing ice, the long-term results can be just as bad. The repetitive hot-cold cycle (the body’s 98.6 degrees to less than 32 degrees for water to freeze) causes expanding and contracting in your mouth causing micro cracks or craze lines. The enamel of your teeth and any fillings or dental work you may have will expand and contract at different rates. This stress may not be noticeable right away but can shorten the life of your dental work over time. It can also leave microscopic gaps between your tooth and filling…just enough space for bacteria to enter and begin causing tooth decay. Sodas and sports drinks are a one-two punch of issues: acids used for carbonation and sugars for flavor both have dramatic impacts on oral health. In addition, like red wine, many sodas and sports drinks contain chromogens which stain teeth. Sipping on cola throughout the day is like soaking your teeth in sugar for hours…a giant party for the bacteria in your mouth. The dental damage caused by excessive soda consumption has become so great, the name, Mountain Dew mouth, has become synonymous with advanced decay and rotted teeth. To give you an idea of the level of acid in soda, the pH of water is 7 and battery acid is 1. The pH of diet sodas is about 3.2 and sugar-sweetened sodas, 2.5. When you sip a soda, you are closer to drinking battery acid than you may think! Add to that all the sugars in soda and you get dental disaster! Brushing right after eating or drinking foods that cause dental erosion can make things worse. Wait at least 30 minutes to an hour and rinse out with water first. This gives saliva a chance to wash away bacteria and neutralize any acids in your mouth. This entry was posted in Dental Tips, Kids Oral Health, Preventative Dental Care and tagged Foods for Healthy Teeth, preventative dental care, Reduce Oral Decay, Tooth Decay. Bookmark the permalink. Follow any comments here with the RSS feed for this post. Both comments and trackbacks are currently closed.